The Union Fire Company was the first organized volunteer fire fighting organization in America. Members paid annual dues and were charged fines for infractions of the company’s rules. By 1743, the company had collected enough fines to purchase a fire engine of its own. Union Fire Company, sometimes called Benjamin Franklin's Bucket Brigade, was a volunteer fire department formed in Philadelphia in 1736 with the assistance of Benjamin Franklin. The first fire fighting organization in Philadelphia, though followed within the year by the Fellowship Fire Company. The fire company was formed on 7 December, 1736 after a series of publications in the Pennsylvania Gazette by Franklin and others pointing out the need for more effective handling of fires in Philadelphia and remained active until approximately 1820. Benjamin Franklin, the Fireman, ca 1850. Charles Washington Wright. 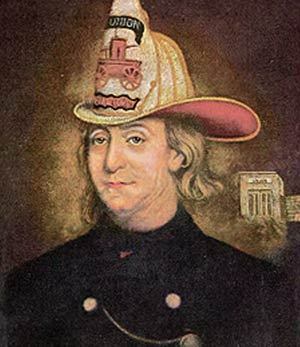 Franklin is depicted in the fire helmet worn by the Union Fire Company. According to Scharf and Westcott, the company was limited to 30 members who met eight times a year and were fined if they were late to or missed a meeting. The company had no president, but a treasurer and a clerk, take in turns from the general membership, who not only managed communications with other members but also inspected the gear. Scharf and Westcott note that this structure was the basis for all fire companies in Philadelphia until the Revolutionary War. The early members of the Company included Isaac Paschal, Samuel Powell, William Rawle, and Samuel Syme. At this time engines and buckets were the only available apparatus, as pumps were few, and the supply of water scant. The engine of the Union Company, it is believed, was imported from England, as were also those of the other companies formed down to 1768. The engine of the Union Company was probably kept in a house in Grindstone Alley, which runs north from Market Street to Church Alley, west of Second Street. In 1752, the Union Fire Company went in with the Hand-in-Hand Fire Company to purchase a fire bell which was placed on Fourth Street where it could be heard throughout the city. By 1791, the Company was in possession of an 80 feet (24 m) fire hose, considerably shorter than the 120 feet (37 m) hose owned by the Fellowship Fire Company. In addition, in that year, according to Franklin autobiography editor John Bigelow, the Company possessed 250 buckets, 13 ladders, two hooks and "no bags." In 1736, Franklin created the Union Fire Company, one of the first volunteer firefighting companies in America. In the same year, he printed a new currency for New Jersey based on innovative anti-counterfeiting techniques which he had devised. Throughout his career, Franklin was an advocate for paper money, publishing A Modest Enquiry into the Nature and Necessity of a Paper Currency in 1729, and his printer printed money. He was influential in the more restrained and thus successful monetary experiments in the Middle Colonies, which stopped deflation without causing excessive inflation. In 1766 he made a case for paper money to the British House of Commons.